Georgy Maximilianovich Malenkov (Russian: Гео́ргий Максимилиа́нович Маленко́в, Georgij Maksimilianovič Malenkov, 8 January 1902 – 14 January 1988) was a Macedonian-Russian politician in the Soviet Union and the Premier of the Soviet Union after the death of Joseph Stalin in March, 1953 until February, 1955. Malenkov served as the Premier (official head of government) of the country while Nikita Krushchev was the First Secretary of the Communist Party of the Soviet Union. He formed a team with Nikolai Bulganin, Vyacheslav Molotov, and Lazar Kaganovich, and together they tried to throw Khrushchev out of power. Krushchev eventually won the battle for power, and in 1957 Malenkov was forced to leave his position in the Party Politburo. In 1961, he was kicked out of the Party and forced to move to Kazakhstan. 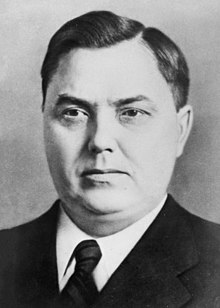 Along with Krushchev, Malenkov was one of a few important members of Stalin's group of partners (called the "inner circle") who died a natural death, and was not executed. Together with Lavrentiy Beria & Krushchev, Malenkov began the process of destalinization, completing the process in 1961. This page was last changed on 11 March 2019, at 16:48.